For steep hills, roadside ditches, retaining ponds and low limb trees, the Convertible can be utilized as a hydro walk behind. Then as easy as flipping a lever the Convertible transforms into a rugged, dependable, Z so you can Ride the Distance! In the early 90s a small Indiana commercial lawn cutter was tired of trailering and maintaining a zero turn rider and a walk behind. The zero turn riders, of course, offered top speed, comfort, and less fatigue. The walk behind was needed for slopes and to get under low hanging tree limbs. Even though both types of machines were needed for his daily business, it seemed to be a waste of money to always have one unit sitting on the trailer while not in use. 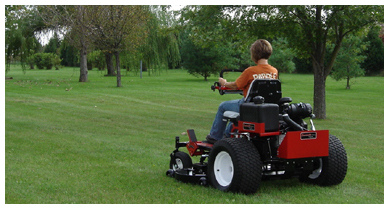 Using his existing lawn maintenance business as a test bed, he developed a zero turn rider that could be converted into a walk behind. Featuring a patented swing arm control, the conversion requires no tools and could be converted within a matter of seconds. In 1996, Rich Manufacturing started producing the 2 in 1 machine under the name Convertible. With the Convertible you get the comfort of a rider with the flexibility of a hydro walk behind all in one machine! With this fairly new innovative product the end user only has to purchase one machine, maintain one machine, and trailer one machine but still has the convenience of both a zero turn rider and hydro walk behind. Whether handling a steep hillside, low hanging objects or hard to reach places the Convertible is the answer to reducing trim time and equipment cost. Even though the concept of the Convertible will always remain the same, Rich Manufacturing will continue to strive to improve the performance and durability of our product.